Soweto is a township in Johannesburg located about 45 minutes away from where Mr. Deep and I live. The name is derived from South West Township. Soweto is the largest township in the country and over one million people live there. A township, you might remember from my earlier posts, is a an area where black people were forced to live during apartheid. Soweto is the home of a lot of history and significance in part due to a student uprising there in 1976. Students marched in the streets to oppose a new law stating that at least half of their school instruction was to be taught in Afrikaans, the language of the white ruling party. During the protest a young student named Hector Pieterson was shot and killed by police. It is estimated that as many as 700 protesters were killed although the official reported number is much lower. The violence created a lot of attention, distress and shock over apartheid both in South Africa and internationally. 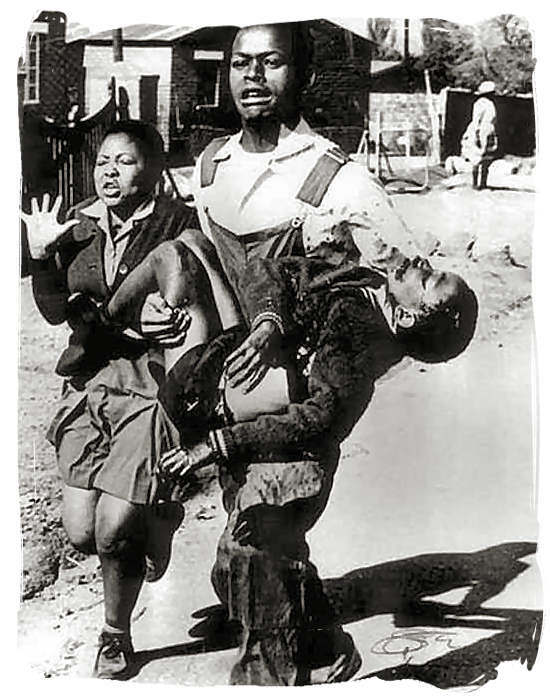 This is the famous photo of a dying Hector Pieterson being carried by one of his classmates after he was shot by police. The photo was taken by Sam Nzima and it captured the attention of the world and brought increased awareness to the issue of apartheid. In addition to the Soweto uprising, Soweto was home to Nelson Mandela and Desmond Tutu. In fact, they both lived on the same street. Vilakazi Street is the only street in the world to have housed two Nobel Prize winners. A few weeks ago when my parents were here, the four of us visited Soweto. We took a bus tour which included the Hector Pieterson Memorial and Museum. We also saw a home that Nelson Mandela lived in for a time, the home where Winnie Mandela still lives, and other sights. Parts of Soweto are similar to any middle class neighborhood. There are brick homes on tree lined streets, restaurants, a mall and a hospital. There is a part of Soweto that is an informal settlement similar to Diepsloot. This section is precisely on the other side of the tracks from the middle class area. While there is 25% unemployment in South Africa overall, in the informal settlement in Soweto the rate is 70%. We got out of the bus to take a walking tour the informal settlement area. You may be thinking that it's strange to take a tour and walk around and look at poor people. I don't disagree. We all felt a little weird about it. The people in the informal settlement did not seem to mind though. They were very polite, saying hello to us and thanking us for coming. I guess they think the more people who see the area, the more it might help to bring about changes. Or maybe they are just used to having visitors. A young man named Vusi, who lives in the informal settlement, showed us around and brought us into the shack where he lives with his brother. The one room shacks are made mostly of corrugated metal. Like Diepsloot there are people everywhere and tons of little kids running around. There are stores and restaurants and all kinds of services in structures created out of various scavenged materials. When the tour ended, I think we all felt pretty horrible. The lack of employment is an overwhelming problem. I especially fely badly for the little kids who did not ask to be born into such difficult circumstances. The kids all seemed fine though, running around and playing in the dirt. The little ones are too young to know what they don't know. Chicken for sale. Not sure where the seller went off to. Vusi (right) and his brother inside their home. Take out restaurant and store. Notice how the roof is being held on. Very well said, and I like your pictures. The "French" on the Kota menu might also refer to the French fries. On the sandwich. I had just posted something similar on my FB page and got a lot of responses because I had thought what I had was a Bunny Chow. Which is something you get in Durban and it has curry in it, not French fries. Glad to see the Kota mentioned here again. That is what I had. French could mean french fries although they had chips listed on the menu too so I wasn't sure. I didn't dine at the Kota and haven't had bunny chow or bunny chow with french fries (kota) yet either. So much new food to taste, so little time! I love peri-peri sauce and am already concerned about the future when I might have to eat less of it. Thanks for your kind comments! What a service you're doing by describing the township and the hardships. There's nothing like first-hand experience to convey the reality of how many people live. I love the history lessons. You are a fantastic storyteller and may want to pursue a writing or teaching career.